Fit: Runs slightly small. Sizing up 1cm is recommended (if you measure in at 60cm, go with an XL instead of a LG). I would recommend this helmet if you’re in the market for an open face. It fits true to the sizing chart, which is to say it’s right on, tight out of the box but loosens up after a short period. Hard to get goggles on with this helmet, have to select the right frame so think about that when considering purchasing. Noise level is moderately high but not unbearable. Can wear earplugs if necessary. It’s light and comfortable. Awesome looking helmet which is what first caught my eye. I was looking for the retro look and this helmet seemed to have exactly what Iwas looking for. I decided to spend the addition $$$ on the carbon fiber model opting for a more lightweight version. Unfortunately this helmet fits way too low on my head. It is so close to my brow that it interferes with my glasses and vision. After wearing it on few rides I have placed it on my shelf for good. Another "It seemed like a good idea at the time" mistake. Only wish I had returned it right away. Arai Helmets have spoiled me for life and I'll never use anything else again. My bike has zero wind protection and at highway speeds it feels like my head is being pulled off my shoulders-- so much lift that it's unusable for me. I don't know what speeds the guy who says "doesn't lift up on the freeway" rides at, but at 75+ it's too much. Wanted to switch to a 3/4 helmet for the summer as a slight relief to the heat (I rock a modular shoei neotec). 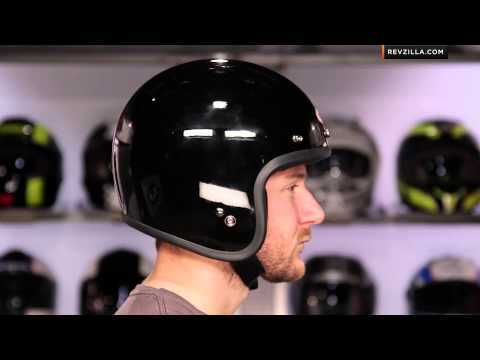 I tried on several (biltwell, Daytona, etc.) and felt that bell was the way to go. Like anything else when it comes to my bike I figured why not go all out and get the one you truly want so I shelled out the extra bread for the carbon. Best 3/4 helmet to date. Super light and doesn't lift up while at highway speeds. Very cool features. The helmet ran a little small to size. I was in between the sizes and took the larger size and it still seemed small. Air flow is not as good as I expected, in the hot days in South Carolina, your head will sweat. However, overall a great helmet, little heavier than I thought, but I have worn Bell for a great number of years. They are always a quality product. Sadly when living in a place as awkwardly expensive as London in England you'll have to start pushing some dreams further into the future. With rent prices being as truly insane as they are, I myself do not own a motorcycle (yet!) however I do own the license and when I get a chance I'll take the ride long and hard. For someone like me who gets to ride a bike here and there (and note that when I do, I ride into double digit hours!) 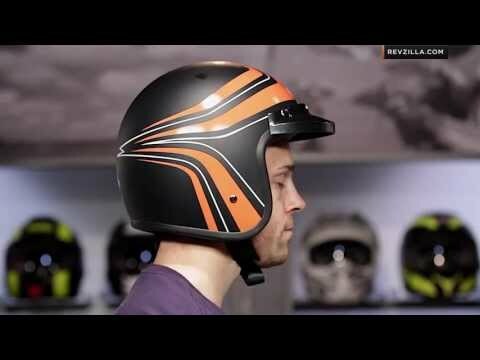 especially when pulling towards a more cruiser-type style, this helmet is the bee's knees! Its insanely light weight means you can ride into awfully long hours and not feel a strain on the neck, back or shoulders. It can get very breezy when hitting the highway, but it's part of the experience as some may say. The loudness level on this gets a bit iffy when on much higher speeds as well, however on a nice cruise where you want to hear your bike grunt and growl, this does justice! As far as and sizing comfort goes, I was surprised how a size M fit me, as my last helmet was a size L. A couple of pressure points here and there, but with a little thumbing on the foam shell you can easily mould this into a far more tailored fit, making it a truly comfortable and custom feel. The materials on this are second to none. I love the leather and suede interior, which gives this a really beefy deluxe look. It's a good balance between aesthetics and practicality but as far as cruiser crowds go (and as this is the smallest legal helmet allowed in the EU) this helmet is a definite must for Harley, Victory, Indian, Triumph and other known cruiser brand riders! Best bell custom to date! Light weight & comfortable, love the bubble mask I got with it. I recommend this helmet. I look like Marvin the Martian. It's not the helmets fault, it's my big noggin. Regardless, great helmet very comfortable and very light. I need a really light helmet because I have neck and back issues. 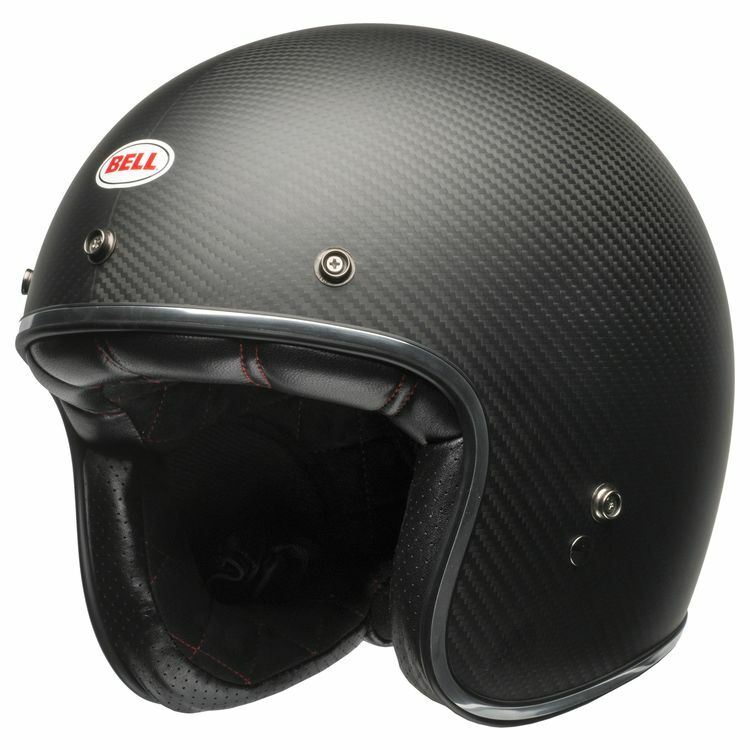 Retro look I was searching for, the carbon fiber built and the close fit..cant be more excited! Where is this helmet made? The shell is thinner than that the fiberglass? BEST ANSWER: About the same but it is ridiculously light. Can I put a Bluetooth device on this helmet? Like Scala G9x.. This helmet is very low profile. I don't think there's much wiggle room for space. However, unlike the other Custom 500s, the carbon version does have removeable cheek pads. what is the actual weight of this carbon fiber helmet? BEST ANSWER: 880 grams for the Carbon 500 which is a little under 2lbs. Can the snaps be removed? How big are the holes do you think? is the profile smaller than the regular 500? BEST ANSWER: A bit larger than the vintage 500s Allan. There is more real protection packed in there. Its very comfortable and you feel protected without feeling like a mushroom head. However, I am not familiar with a modern 500. I wear a large long oval arai Signet helmet. Will this helmet fit me?